It’s a smooth rectangle box with flowers on top. It plays Edelweiss when it is wound-up and it has a miniature skeleton key that fits in a small lock. I don’t wear much for jewelry, but it holds the few things I have. My high school ring, my father-in-law’s martial arts pin (safe keeping for Vinnie), an overly creased and faded slip of paper with the address of the host family I lived with in Sighisoara, a pendant from my first Mother’s Day. It holds pieces, it holds stories. Really, it isn’t a jewelry box at all, but a story itself. We honeymooned in Italy and as our trip wound to a close, we wandered the streets of Venice in search of the perfect mementos for each of us. 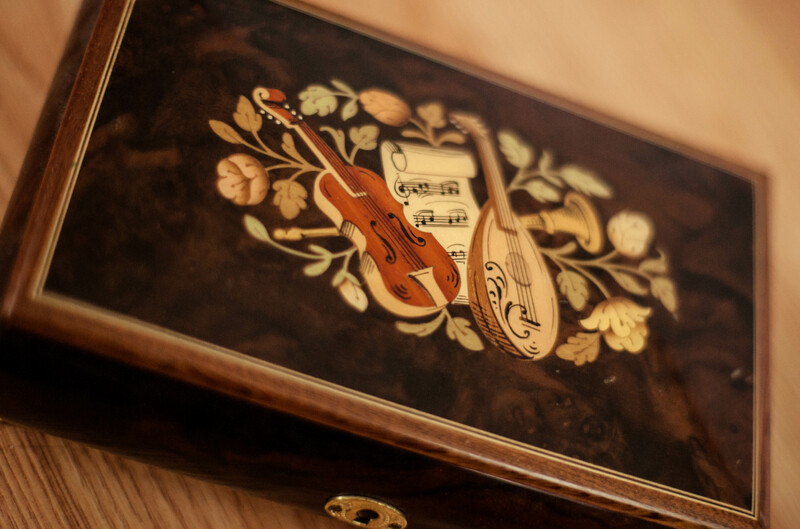 Vinnie chose an Italian leather wallet and I set my heart on finding a jewelry box, one of the smooth lidded musical boxes at every street market in the city. I didn’t want just any box, I wanted a brown rectangular one, a medium sized one, nothing big or gaudy, and most importantly, I wanted it to play Edelweiss, because it reminded me of a childhood toy record player that played that song in the same tinny, music-box tone. We scoured every market, every shop, every table with goods to be sold, but found none with the precise combination of shape, color, size and song. Six months later, on our first Christmas morning, we exchanged small gifts. We sat on the floor of our tiny apartment and took turns unwrapping each others offerings. We didn’t have children yet, but our income was small and so gifts were accordingly so. I can’t even remember what I wrapped and put under the tree for Vinnie. Probably something relating to shaving. Maybe a DVD? I don’t recall. But Vinnie, he had remembered, everything. And I unwrapped exactly what I was unable to find those months earlier. He had it custom made for me and paid the shipping from Italy. I cried when I turned the key and heard Edelweiss. If he never buys me another gift as long as we are alive, I am satisfied. Lila asked me to wind it the other day and as it began to play, I started to tell her a little of the story behind the box. Oh, she humored me only briefly, I’m going to dance like a ballerina now. All she needed was the music, the story can wait until she is old enough to understand it, or better, to appreciate it. A friend recently posted this profound and “fun fact” on Facebook. Every elemental particle, Oxygen, Iron, Carbon… everything that exists in your body, every one, was created in the middle of an ancient, gigantic star. And perhaps this is me, changing the subject because I would much rather be a ballerina for a few minutes like my daughter, but I just don’t find it all that important or mind blowing. I don’t mean to be overly simplistic and I certainly don’t want to seem as though I am not in awe of the complexity and wonder of how the universe, the world, this ground I’m standing on, these hands I’m typing with, came to, well, be. Because I am, in awe, that is. I am perplexed and in wonder at how amazing creation is. Who isn’t? I just prefer to think in terms of the relationship behind us being and the purpose behind our creation. And honestly, I prefer to consider myself as greater than a random act of particle ignition. And for me, that is enough. I can live with it, I can dance to it. Truth is, even I don’t need to know how the jewelry box got to the spot under my tree. I don’t care what wood it is made out of or how the pieces were cut and carved and formed together. I don’t need to know the mechanics behind how the miniature music box works or which flight it was on as it traversed the globe to find itself unwrapped in my lap that Christmas morning. I care about the relationship. And I think, in my own can’t I just dance, mentality, that is what God might just care about too. I marvel at his creation, but I marvel even more at the ways he designed my heart and mind to be uniquely, me. And the fact that he is interested in all of the silly small goings-on here in my silly little life? Now that, for me, is mind blowing. I’m not saying I have any answers as to how he did what he did, I am just more concerned with what purpose I can fulfill since I am here, than how I got here. Life is a gift. How we choose to delight in it, either through careful analysis or beat-of-our-own-drum dancing, is up to us. I’m just content to wait until I can hear it from creator himself, how he envisioned the worlds he created, how he made something from nothing, how he made Vinnie and I and how he knew our children’s names before we had even held hands, and long before we ever wandered Venice in search of Edelweiss in a perfectly designed jewelry box.